Director/Curator Mary Reid’s counterview of contemporary artistic practice in Winnipeg pleasantly interrupted a reverie of city-centric exhibitions asserting legacies and mythologies of local artists and art production. The Winnipeg Art Gallery, of which Reid left her own legacy as Curator of Contemporary Art from 2004-2011, celebrates Winnipeg Now (September 29 –December 30, 2012), while Plug In Institute of Contemporary Art is currently midway through My Winnipeg Project: a series of four exhibitions from September 8, 2012 to March 17, 2013 that both reinforce and complicate provincialism when addressed on such a focused, albeit ambivalent scale. 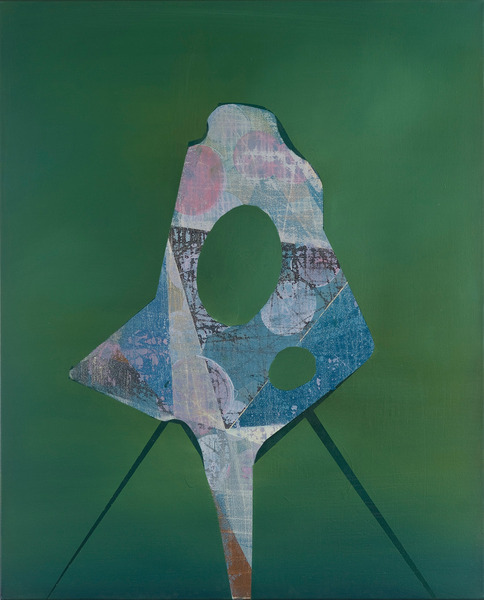 In contradistinction, Re-Configuring Abstraction is a collection of artists who are deeply engaged in the materiality of paint and surface and moving away from previous representational and/or narrative strategies. While all the artists have ties to the University of Manitoba’s art program, as either instructors or former students, this is contemporary painting in dialogue with wider networks. In this instance, abstraction rooted in academic training and probing historical referents directly through Surrealism, collage and architectural forms. In sum, it’s the kind of exhibition that turns painting students on and draws the non-inducted in through the corporeality of its matter and processes of execution. Dil Hildebrand, Domestic Arrangement, 2012, oil on canvas, 193 cm x 147 cm; Courtesy of Pierre-François Ouellette Art Contemporain. Dil Hildebrand, who gave an informative talk before the opening on his development as a painter since winning Canada’s coveted RBC painting prize in 2006, spoke of his interest in painting “tricks” to manipulate surface and perspective. Here trompe l’oeils are less theatrical than in previous works with a gridded green board cutting-mat providing a prop for curious architectural forms to reside uneasily. 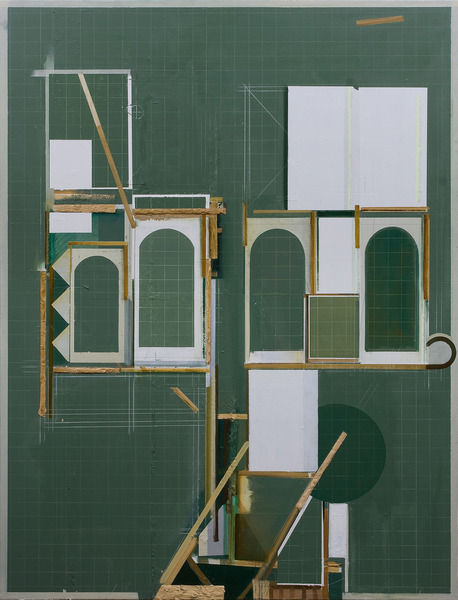 In works such as Domestic Arrangement and Small Distinction (both 2012) the forms appear on the cusp of structure, a slippage between nonsensical paper architecture and set design studies manifested in paint. German born Holger Kalberg shares Hildebrand’s sensibilities in working from representations of architectural forms. However, Kalberg’s earlier series of modernist house paintings have now appeared to morph into surrealistic organisms, as in his newest Prop series (2012), obliterating cohesive planes into undulating spectral layers of color. This thread is almost literally echoed in the work of Krisjanis Kaktins-Gorsline and his stenciled ribbons that eviscerate compositions of indeterminate structures that vacillate between shadowy landscape and biomorphic fragments. Kaktins-Gorsline is interested in patterns and Reid outlines his process of making as one that involves random draws of stencils and colors from previous paintings, renegotiating the rules of engagement in new disseminations with irregular aesthetic results. Holger Kalberg, Prop 1, 2012, oil on canvas, 81.28 cm x 66.04 cm; Courtesy of Monte Clark Gallery. Regarding aesthetics, Derek Dunlop’s paintings in the exhibition appear to queer the space with their fascinatingly grotesque skins. 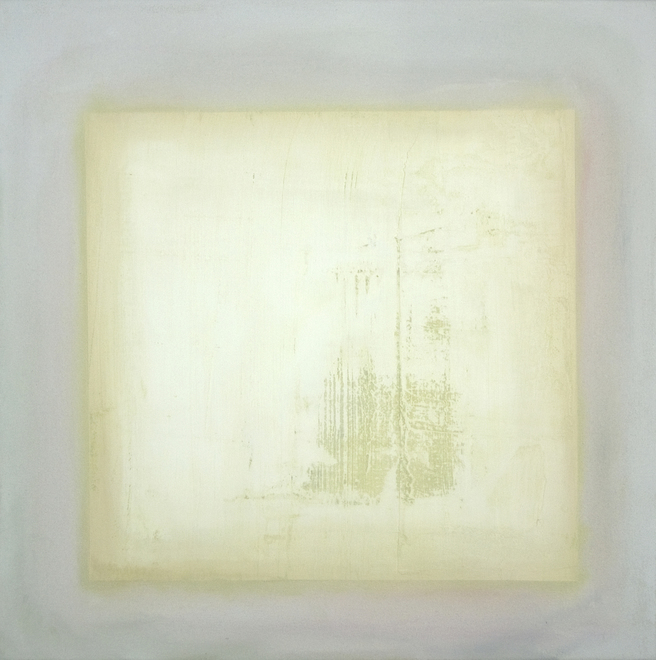 Gridded diagrammatic forms confound in their meaning as in systematic (white) (2010), and the eye shifts to the heavy application of paint and sickly skin-like palette of the rainbow-shaped forms in untitled (2010-2011). While the most abstract of all the artists on view, his work simultaneously appears present in its dense material corporeality while maintaining a mystical element in its obscure markings. Reid acknowledges in her accompanying essay that Dunlop’s inclusion “was a means to steer this conversation about abstract painting toward another project, one that looks at abstraction in terms of pure form and the materiality of the medium itself.” It’s an intriguing proposition, one that speaks to the continued vibrancy and relevance of contemporary abstract painting practice not only in Winnipeg, but beyond.